Baile na Coille, Woodpark, Annaghdown. 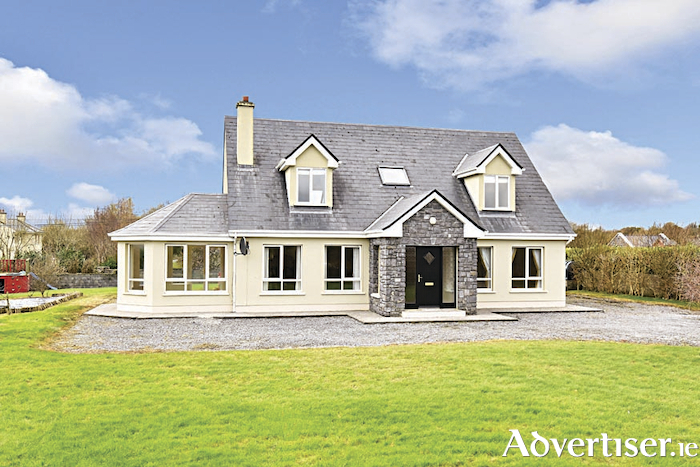 Sherry FitzGerald is offering this four bed detached family home located at Woodpark, Annaghdown, Co Galway, to the market for sale by private treaty. This home is close to Annaghdown National School with the villages of Corrandulla and Clonboo within minutes drive, and Galway city centre is just 12km away. This property is situated on a c0.47 acre site, and was purchased by the current owners as a shell in 2006 and finished and fitted to a high standard throughout. All rooms are bright and spacious and offer any potential purchaser a quality home in a sought after location. The home is approximately 2,303sq ft with accommodation including entrance hall, sitting room, open plan living/kitchen/dining room, sun room, utility, wc, and en suite bedroom on the ground floor. There are three further bedrooms on the first floor, en suite and walk-in wardrobe to the master bedroom, and bathroom. The BER is C2 on BER cert number 108624065. The property benefits from a large southwest facing rear garden with stone wall boundary. This is a quality family home and viewing is highly recommended. Viewing is by appointment with Rachel O’Dowd, Sherry FitzGerald, One Galway Central, Forster Street, Galway, 091 569 123/087 3493363 or email [email protected]. Page generated in 0.1277 seconds.